The brand new KS-W1021 Heavy Duty Outer Jacket & Inner Core Cut & Strip Machine. 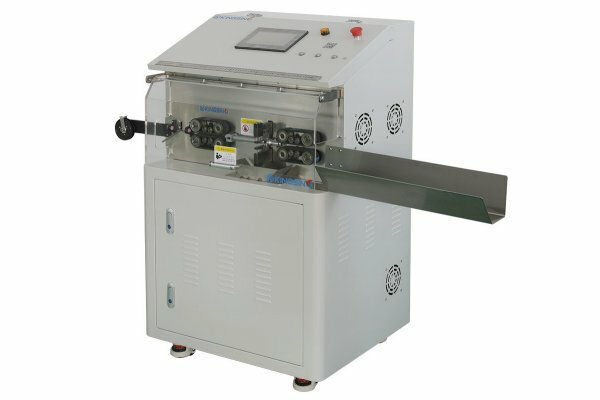 This new Outer Jacket & Inner Core Cut & Strip Machine is a new, updated version of the old KS-W102 Outer Jacket & Inner Core Cut & Strip Machine. The KS-W1021 Outer Jacket & Inner Core Cut & Strip Machine will also process cables up to 10mm O.D however this new machine is capable of stripping 5 inner cores compared to 3 inner cores on the KS-W102. The Outer Jacket Stripping lengths are as follows: Leading End: 25-240mm, Trailing End: 20-140mm. More information will be available soon.